After fifty plus hours of playing Middle-earth: Shadow of War, I have finally ground to a halt, in more ways than one. I have completed the Gondor, Shelob, Eltarial and Carnán quest lines, as well as the Brûz and Nemesis missions. I have also unlocked all the skills gained from the Shadow of the Past session play. Over the course of a fortnight, I’ve tackled all the “busy work” sub missions, such as the collectable Gondorian artefacts and Shelob’s memories. My approach to Middle-earth: Shadow of War has been very focused and methodical. As a result, I have conquered all the regions that are currently available. Each fortress is populated by epic level Orcs that are loyal to the “Bright Lord”. Overall, it has been a very enjoyable experience, although the quality of gameplay has been somewhat inconsistent. Middle-earth: Shadow of War has several flaws and the endgame is one of them. Compared to the previous game, there is a degree of skills bloat this time round. Some do seem somewhat superfluous, such as the ability to poison kegs of grog from range. However, picking the right skills for your playstyle and gear build is key to success. Some of the skill modifiers are essential and give the player a distinct advantage. Freeze Vault and Shadow Strike variants (especially the one that summons the target towards you) help immensely. It should be noted that combat is more complex this time round. The higher density of enemies makes stealth far harder. Taking the high ground and considering your next move helps immeasurably. At street level, especially in the fortresses it is very easy to become overwhelmed by enemies at times. Freeze Pin, Elven Fire and Rage can be used tactically to subdue a primary target and then clear swarming enemies. As with the previous game, running away if things get out of hand is a valid tactic. Summoning a body guard or a dominated beast can also be fun, although flying a Drake with a keyboard is not exactly easy. The third act of the game, is a series of Siege Missions which are especially gruelling. Initially these are quite engaging as you plan your tactics and equip your assault force with suitable skills. But there are ten stages to this part of the game, where you repeatedly defend your five major fortresses. Naturally, the difficulty increases the further you progress as well as the duration of each siege. It does become a little repetitive towards the end and you feel at times like you’re simply plugging holes in a dike. You go from capture point to capture point holding back the enemy and healing your high-level orcs. There is often a tipping point where you know that events have gotten beyond your control and you can feel the battle slipping away from you. Hence there is an element of monotony to this part of the game and if you’ve already cleared all the other quests in the game, it can feel like a treadmill. During the course of my play through, I’ve also made some basic errors that have now come back to inconvenience me. One of these being the equipment challenge which allows you to upgrade specific legendary gear. 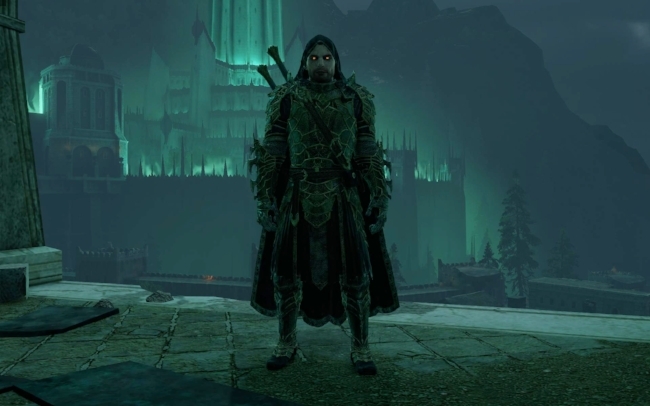 One of the easiest sets to obtain in the game is the Bright Lord armour which is gated behind Ithildin doors. There are word puzzles to solve to open them. I obtained this set quite early on in the game and the gear scaled to the level I was at the time. To upgrade the gear, I had to recruit specific Orc captains. However, by this time I had killed, replaced or seeded all relevant enemies in the region and was unable to find any Orcs that met the criteria. The only way to resolve the issue would be to kill my dominated Orcs and allow new ones loyal to Sauron to spawn. As I didn’t relish this prospect, I simply collected another legendary armour set, via the vendetta system. As I am now at level cap, the gear drops where of a comparable rating. The lore breaking story of Middle-earth: Shadow of War is very inventive but a bit farcical at times. It really does play fast and loose with the established canon and flat out contradicts it at times. But despite these transgressions it is still quite enthralling. The nemesis system and the personalities of the various Orc are still at the games core. However, the endgame suffers due to the gating of Orcs behind loot boxes. 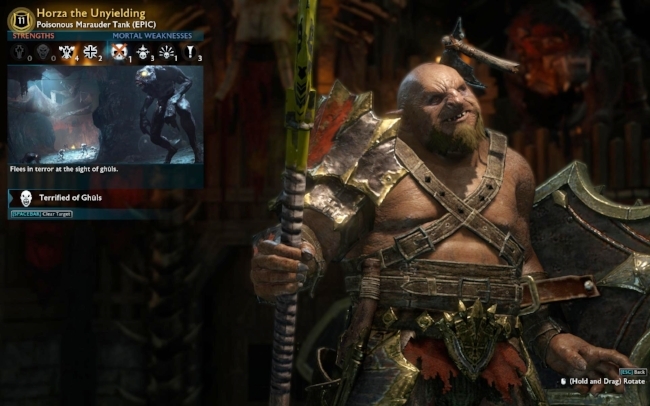 As a player you have far less of an emotional connection to an Orc that you’ve literally just obtained from a crate, over one that you’ve fought, dominated and grown accustomed to. Furthermore, even the top tier Orcs that fight for you are somewhat squishy. Pit fights also are far from an exact science and I’ve lost some über Orcs to surprisingly low-level enemies. Integrating a cash shop into this part of the game has clearly had a detrimental effect upon the final act of Middle-earth: Shadow of War. I have now reached the stage where I shall take some time out from Middle-earth: Shadow of War. As previously mentioned, the last stage of the game has been a bit of a grind and I would rather wait now for further content to be released, rather than kill my passion by just pottering about achieving nothing in particular. The release time table for the DLC was announced yesterday and it would appear that there’s no further narrative driven content until 2018. I don’t mind new Orc tribes to conquer but I do prefer story based content over simple achievements. I don’t regret pre-ordering the game, as it has been fun to participate in an event as it happens. However, if Shadow of War follows the pattern set by Shadow of Mordor, then a drop-in price may well occur by the end of the year. Certainly, buying the game at a discount will help compensate for the weak areas in the gameplay.